When I first heard Feist, I was initially attracted, but somehow she failed to capture my heart and mind enough for me to put down the cash. But I admit that my own moods can affect my perceptions about new music, and after two years, I finally came around and picked up Let It Die. You may have heard "Mushaboom" and "Secret Heart" on standard commercial radio, and if you listen to the excellent World Cafe, you've had multiple opportunities to hear more of the music off this album. Most of the tracks on Let It Die have a spare and open arrangement. Feist's voice takes center stage. She's not a loud singer, but her voice is steady and clear and effective (and probably stronger than it seems). Combining the minimal music with her distinctive voice creates a somewhat intimate listening experience. This is especially true when using headphones. The music wouldn't be out of place in a small room with a handful of appreciative listeners. A few of the songs remind me of something you might have heard on the radio in the seventies. "One Evening" and "Inside and Out" especially give me that feeling. Looking at the liner notes reveals that "Inside and Out" is a Bee Gees cover. I suppose that explains that song and some of her apparent influences. I have to admit that the seventies influence I detected two years ago prevented me from really giving her music a chance. I got over it. I think "When I Was a Young Girl" is my favorite track on Let It Die. Oddly enough it is a traditional song but may be the most rhythmically complex on the CD. Feist also gives one of her stronger performances with that song. Her singing is more full throated and emotional. Anyway, I obviously like Let It Die. So, I'm sharing as much as I can with you using my meager writing abilities. But there is also an intentional coincidence in the timing of this post. 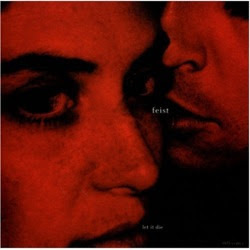 Feist is coming out with a new CD called The Reminder that should be available starting in May. Just a heads-up. Feist has an offical homepage with some music samples. I always hesitate to send people to MySpace since it is one of the ugliest places on the web and people seem to be busy doing things I don't fully understand (I'm probably too old). However, musicians have been using it effectively. I guess it can't be all bad. Here's her MySpace page with more music samples and the like. Just be careful where you click.